The costs of nonadherence rapidly diminish as adherence improves. For instance, in patients with diabetes, each 10% increase in medication possession ratio rates reduces overall health care costs by 9% to 29%. For instance, in patients with diabetes, certain erroneous beliefs were associated with less consistent medication use. Ultimately, education is the key to improving adherence. For managed care plans, investing in medication adherence initiatives is a winning proposition. 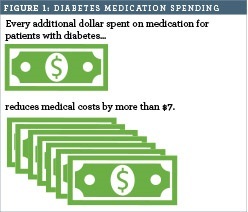 It has been estimated that for every dollar spent on medication adherence initiatives for patients with diabetes, $7 in health care costs are saved (Figure 1). Given that physicians have little time with patients and that pharmacists are the most accessible health care providers, improving adherence is an important opportunity for pharmacists to improve patient outcomes. Many studies show the value of pharmacists in improving patient outcomes through adherence-promoting initiatives. Pharmacists can improve adherence in several ways, including through individualized coaching, refill reminders, and medication synchronization. In 2014, nearly three-fourths (74%) of independent community pharmacists offered MTM services, and approximately two-thirds (67%) offered programs to improve patient adherence. World Bank. Health expenditure, total (% of GDP). http://data.worldbank.org/indicator/SH.XPD.TOTL.ZS. Accessed November 2015. Amara S, Adamson RT, Lew I, Slonim A. Accountable care organizations: impact on pharmacy. Hosp Pharm. 2014;49(3):253-259. doi: 10.1310/hpj4903-253. Manolakis PG, Skelton JB. Pharmacists' contributions to primary care in the United States collaborating to address unmet patient care needs: the emerging role for pharmacists to address the shortage of primary care providers. Am J Pharm Educ. 2010;74(10):S7. Stafford RS, Bartholomew LK, Cushman WC, et al. Impact of the ALLHAT/JNC7 Dissemination Project on thiazide-type diuretic use. Arch Intern Med. 2010;170(10):851-858. Ho PM, Magid DJ, Masoudi FA, McClure DL, Rumsfeld JS. Adherence to cardioprotective medications and mortality among patients with diabetes and ischemic heart disease. BMC Cardiovasc Disord. 2006;6:48. New England Health Institute (NEHI). Thinking outside the pillbox. NEHI website. www.nehi.net/writable/publication_files/file/pa_issue_brief_final.pdf. Published August 2009. Accessed November 2015. Balkrishnan R, Rajagopalan R, Camacho FT, Huston SA, Murray FT, Anderson RT. Predictors of medication adherence and associated health care costs in an older population with type 2 diabetes mellitus: a longitudinal cohort study. Clin Ther. 2003;25(11):2958-2971. Sokol MC, McGuigan KA, Verbrugge RR, Epstein RS. Impact of medication adherence on hospitalization risk and healthcare cost. Med Care. 2005;43(6):521-530. Jha AK, Aubert RE, Yao J, Teagarden JR, Epstein RS. Greater adherence to diabetes drugs is linked to less hospital use and could save nearly $5 billion annually. Health Aff (Millwood). 2012;31(8):1836-1846. doi: 10.1377/hlthaff.2011.1198. Stuart BC, Doshi JA, Terza JV. Assessing the impact of drug use on hospital costs. Health Serv Res. 2009;44(1):128-144. doi: 10.1111/j.1475-6773.2008.00897.x. UnitedHealthcare launches first diabetes plan with incentives for preventive care [news release]. www.enhancedonlinenews.com/portal/site/eon/permalink/?ndmViewId=news_view&newsId=20090115005315&newsLang=en&permalinkExtra=. Published January 15, 2009. Accessed November 2015. Belluck P. For forgetful, cash helps the medicine go down. The New York Times. www.nytimes.com/2010/06/14/health/14meds.html?pagewanted=all&_r=0. Published June 13, 2010. Accessed November 2015. Mann DM, Ponieman D, Leventhal H, Halm EA. Predictors of adherence to diabetes medications: the role of disease and medication beliefs. J Behav Med. 2009;32(3):278-284. Hirsch JD, Gonzales M, Rosenquist A, Miller TA, Gilmer TP, Best BM. Antiretroviral therapy adherence, medication use, and health care costs during 3 years of a community pharmacy medication therapy management program for Medi-Cal beneficiaries with HIV/AIDS. J Manag Care Pharm. 2011;17(3):213-223. Taitel M, Jiang J, Rudkin K, Ewing S, Duncan I. The impact of pharmacist face-to-face counseling to improve medication adherence among patients initiating statin therapy. Patient Prefer Adherence. 2012;6:323-329. doi: 10.2147/PPA.S29353. Marrufo G, Dixit A, Perlroth D, Montesinos A, Rusev E, Packard M. Medication therapy management in a chronically ill population: interim report. http://innovation.cms.gov/Files/reports/MTM-Interim-Report-01-2013.pdf. Published June 2013. Accessed November 2015. Healthcare Intelligence Network. New chart: how a pharmacist helps to improve medication adherence. www.hin.com/chartoftheweek/pharmacist_improve_medication_adherence.html. Accessed November 2015. Lin EH, Von Korff M, Ciechanowski P, et al. Treatment adjustment and medication adherence for complex patients with diabetes, heart disease, and depression: a randomized controlled trial. Ann Fam Med. 2012;10(1):6-14. doi: 10.1370/afm.1343. NCPA digest: community pharmacists promoting medication adherence, generic drug savings [news release]. National Community Pharmacists Association website.www.ncpanet.org/newsroom/news-releases/2014/10/28/ncpa-digest-community-pharmacists-promoting-medication-adherence-generic-drug-savings. Accessed November 2015.